Crowns and bridges are dental treatments that can help in fixing the appearance and function of the teeth that have been damaged prematurely due to injuries or accidents and tooth decay. These treatments can guarantee long-term strengthening to the weakened teeth to prevent further damage that can result in tooth loss. Shawn A. Walls, DDS. Provides Dental crowns and bridges which can help with the restoration of the teeth as well as to prevent any other dental complications a damaged tooth can cause. What can Dental Crowns and Bridges do? A Crown is a dental appliance that is shaped like a cap placed in a tooth to strengthen and protect it from further damage. 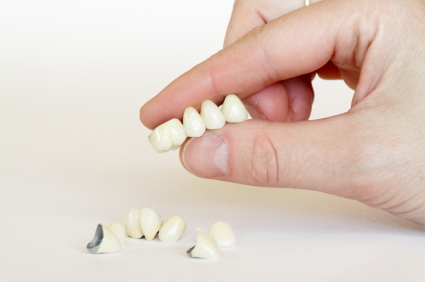 These are custom-made to make sure that it would blend with the other healthy teeth structure a patient has. A dental crown when placed can protect the entire tooth structure which can be maintained by proper dental hygiene partnered with regular dental cleanings and checkups. It is made of a selection of materials like porcelain, resin, metals, or stainless steel. For its placement, the tooth should be prepared by removing some of its surfaces and by taking an impression for the perfect fitting of the permanent crown. A temporary crown will be placed to protect the exposed teeth from bacterias or infection. A Bridge can work the same as a crown, but instead of only restoring a tooth structure that is still intact, a bridge can also replace a single or multiple missing teeth. It is composed of dental crowns that are at the opposite sides with pontics (artificial tooth) in the middle to act as the replacement. The dental bridge can help in preventing the teeth from moving or shifting into incorrect position due to the gap left by a missing tooth. For choosing the type of material to be used, it will depend on the location of the teeth to be replaced since it might need durability to handle chewing forces. The placement of a dental bridge requires preparation of teeth that are at either side of the gaps where the crowns will be placed to support the pontics. Dental crowns and bridges are the ideal restoration treatments which can help in protecting the teeth and preventing any further damage to the teeth and facial structure. Prevention is always better than cure, remember to follow the advised practices by dentists to have a better overall dental health. Aiming to restore your teeth as natural as it was before? Contact us at Shawn A. Walls, D.D.S. to know more about Dental Crowns and Bridges in Johns Creek, or to schedule your appointment with us.